Quickly becoming known as a superfood, hemp protein can provide the high quality protein your body needs. Protein is a fundamental dietary necessity on various levels. Whether from food or a supplement, the quality of protein is essential. Hemp protein is gathering a lot of attention outside of its typical vegan audience due to the fact that its benefits reach beyond protein content. Hemp protein also contains a high mineral profile, as well as fiber, and omega-3 fatty acids. Hemp's reputation isn't that of protein. Otherwise known as Cannabis sativa, it's an annual woody plant from the Cannabis genus that's been utilized throughout history for its natural fiber, oil, food, recreation, medicinal, religious, and spiritual uses. Different parts of the plant serve a variety of purposes. There was a period when growing hemp was banned. Regulations were lifted in 1998 and thus, full-scale production and hemp product sales commenced. This change came after hemp was bred with a significantly lower psychoactive element, delta-9-tetrahydrocannabinol. All food products must contain less than .3% of delta-9-tetrahydrocannabinol, the psychoactive compound that occurs naturally in hemp. In 2003, regulations were further tightened, forcing hemp food manufacturers to lessen detectable levels of the psychoactive compound even more. In 2008, a group of researchers evaluated hemp products and concluded that they ranged from containing no detectable levels of the compound to well under the max limit at, 0.001%. 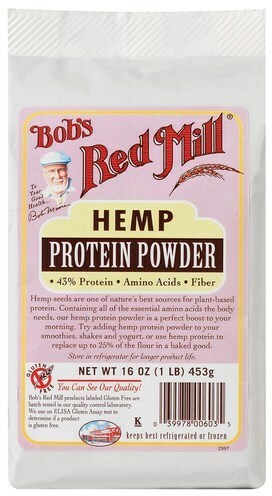 Manufacturers produce hemp protein powder from the hemp nut. There are a number of nutritional benefits we can reap from hemp protein. The primary perceived value is protein content. For a plant protein, hemp has an exceptionally high percentage of protein by weight, which can vary from 30% to 50%. 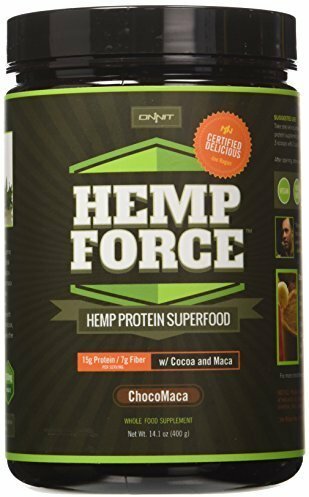 When purchasing hemp protein powder, you should look for a brand that supplies at least 50% protein by weight (15g of protein per 30g serving). The fat content of hemp is also desirable, with a high ratio of omega-3 fatty acids to omega-6s. With less than 10% of its fat content coming from saturated fat, hemp protein is extremely heart healthy. The diagram below provides a detailed view of fat composition in hemp seed. Additionally, hemp seeds contain edestin and albumin — easily digested proteins. This is an appealing nutritional profile for individuals with a gastrointestinal condition. Amino acids are grouped into non-essential (created by the body) and essential (those that must be obtained through diet). Hemp protein supplies all 10 essential amino acids, making it look like a complete protein. However, when the specific amino acids are closely evaluated, you'll find lower levels of three essential amino acids, indicating it is in fact incomplete. On the Protein Digestibility Corrected Amino Acid Score (PDCAAS), established by the FDA, these limiting amino acids give hemp protein a score of 50 to 60, making it comparable to lentils. Hemp protein may be lower than the gold standard, which is casein, it's still a helpful nutrient for growth and repair of lean muscle mass. An additional bonus is the type of omega-6 that hemp protein contains — GLA. This omega-6 fatty acid has been associated with skin and hair health, hormone regulation, cholesterol support, and heart health. 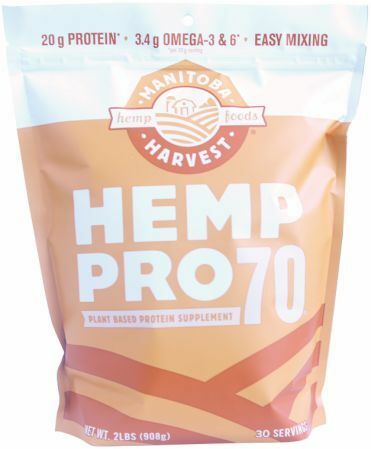 In hemp protein powder, this mineral is found in the concentrated quantity of 483mg per 100g. The benefits of magnesium are far reaching. It is involved in more than 300 biochemical processes in the body. The addition of magnesium helps with calcium absorption, supporting bone health. Further benefits include protein synthesis, enhanced utilization of vitamin B6, improved muscle function, reducing migraines and constipation. Other noteworthy minerals hemp protein contains are phosphorus, iron, and folate. Fiber content is an added benefit. Nutiva packs 8g of dietary fiber per 30g of powder and Manitoba contains 10g of dietary fiber for the same serving. The naturally occurring fiber in hemp promotes gastrointestinal regulation and can benefit heart health. With this amount of fiber, you're well on your way to meeting the recommended daily allowance (RDA) of 30g to 35g per day. There has been some evidence to suggest a link between hempseed and increased memory. Researchers have looked at a concentrated source of hempseed, comparing brain activity and memory variables. However, it's not clear which component of hempseed is responsible for these cognitive changes. If the positive changes are related to amino acids, then the improvements would not be exclusive to hemp protein. 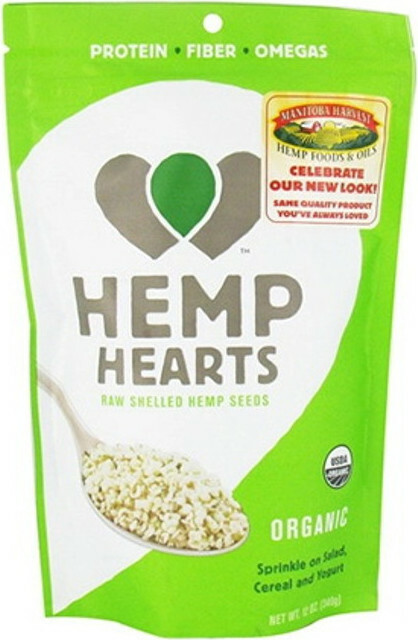 The relationship to heart health and hempseed is due to its omega-3 and omega-6 profile. These healthy fatty acids provide support for a strong cardiovascular system and some studies demonstrate a reduction of triglycerides with intake of omega-3 foods. At various stages of life, hormone balance can be a problem for females. Many uncomfortable symptoms can result from hormone abnormalities. The role of hemp in regulating hormones goes back to the omega-3 and omega-6 fatty acids. Researchers have pinpointed that women who experience hormone imbalance lack GLA (an omega-6 fatty acid) and have a difficult time converting it in the body. Since GLA is a component of hemp protein, it's a helpful dietary addition if dealing with hormone imbalance. Keep in mind, hempseed oil has higher concentrations than hemp protein powder. Unfortunately, the ALA in hemp protein does not convert very well to DHA and EPA, making it a less useful omega-3 source compared to fish oil. tween hempseed and skin problems. 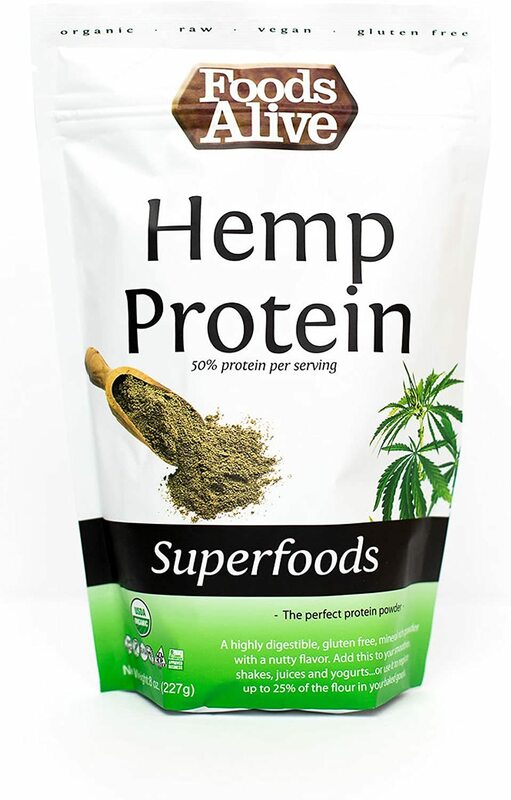 Supplementation with hemp protein can help support your overall protein intake. When used in combination with other protein sources, it can play a role in meeting your unique dietary protein needs. PricePlow is your main source for comparing hemp protein brands, quality, and prices. Purchasing all of your vitamin and supplements here will save you an average of 38% off retail prices. 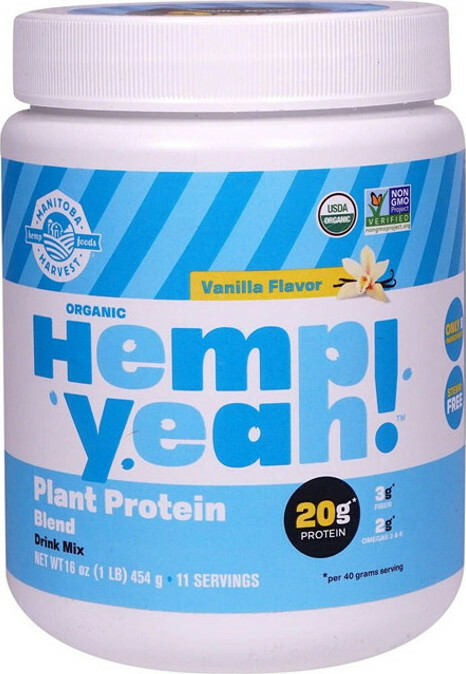 Hemp protein has a nuttier flavor and can be a bit grittier than traditional whey protein. 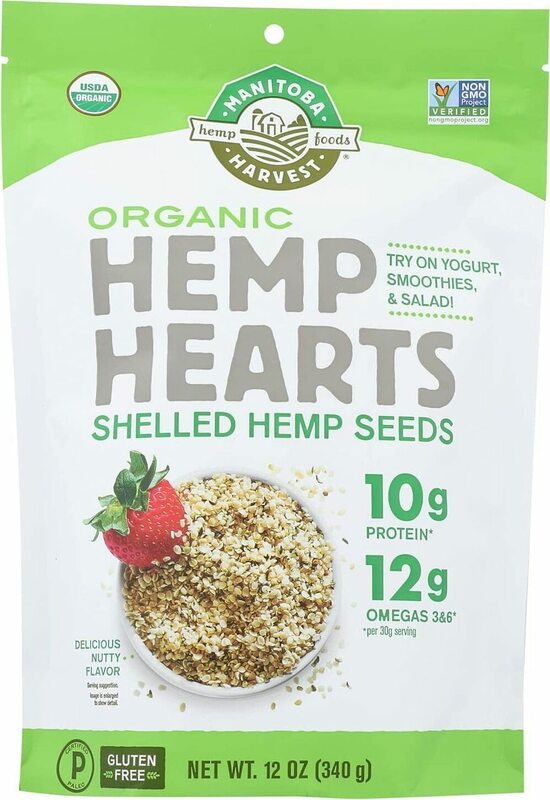 Good quality hemp should contain 50% protein by weight (15g protein to 30g powder), ensuring that minimal fillers have been added. 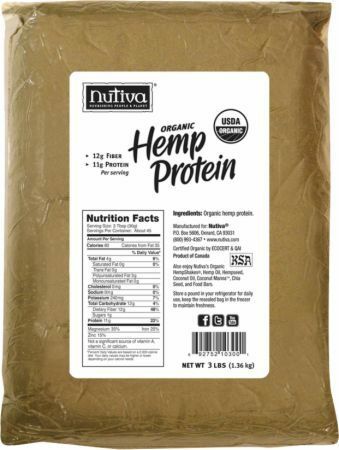 There are many natural hemp protein powders are additive and preservative-free. Jarrow Formulas, Nutiva, and Manitoba Harvest offer good, quality organic products. House JD, et al. ; Journal of Agriculture and Food Chemistry; "Evaluating the quality of protein from hemp seed (Cannabis sativa L.) products through the use of the protein digestibility-corrected amino acid score method;" November 2010. Callaway, JC. Euphytica; "Hempseed as a nutritional resource: An overview;" 2004. Bockisch, M.; "Fats and oils handbook;" Vegetable fats and oils; 1998. University of Maryland Medical Center; "Gamma-linolenic acid;" Reviewed July 2011. Gerster, H.; "Can adults adequately convert alpha-linolenic acid (18:3n-3) to eicosapentaenoic acid (20:5n-3) and docosahexaenoic acid (22:6n-3)? ;" Int J Vitam Nutr Res. ; 1998. Wang, C.; "n-3 Fatty acids from fish or fish-oil supplements, but not alpha-linolenic acid, benefit cardiovascular disease outcomes in primary- and secondary-prevention studies: a systematic review. ;" Am J Clin Nutr. ; 2006. 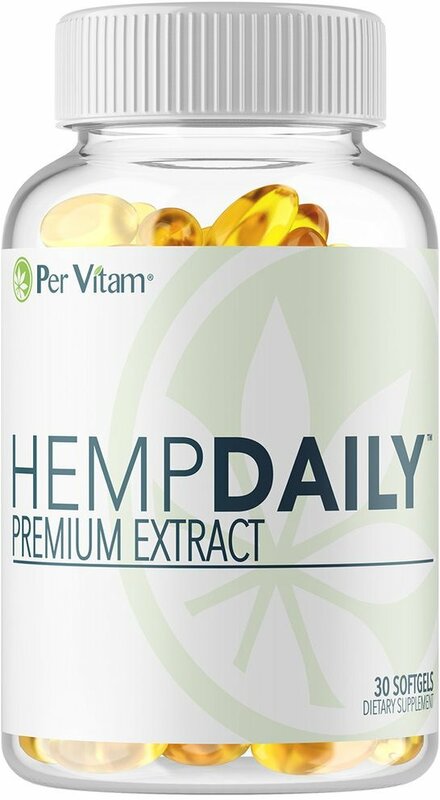 Per Vitam Hemp Daily Premium Extract was created. Manitoba Harvest Hemp Yeah was created. 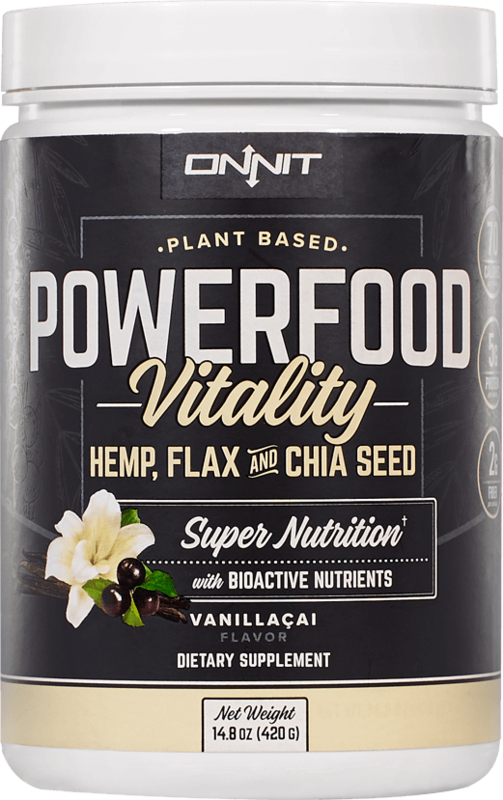 Onnit Powerfood Vitality was created. Sign up for future Hemp Protein news! Click the button below to sign up for future Hemp Protein news, deals, coupons, and reviews! 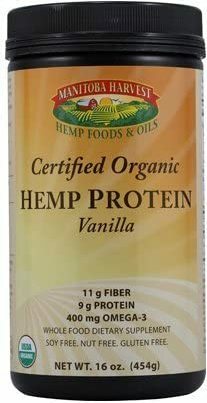 Sign up for future Hemp Protein deals and coupons! Click the button below to sign up for future Hemp Protein deals, news, and coupons! $40.46 This is a Buy 1 Get 1 FREE offer! $8.34 This is a Buy 1 Get 1 FREE offer!